Continuing with yesterday’s newly minted tradition, this morning I met with Pippa Goldschmidt, who has been writer-in-residence at the Genomics Forum for the last four years. Over tea on the roof garden (lucky with the sunshine again) we talked about science, scientists and writing, and how the term ‘writer-in-residence’ covers about as broad a spectrum of possible roles as the term ‘scientist’. Pippa will be running a workshop on fiction inspired by science at the Edinburgh BookFestival as well as chairing some debates there for the Genomics Forum, so I’m hoping to run into her at the Writer’s Yurt for a glass of wine & to continue the conversation. The BBC soundchecks continued throughout the morning and into the afternoon, though they’d moved on to a series of spoken whoops – ‘Oh Yep’ ‘Oh Yep’ – as well as the usual ‘One Two’. I assume there is a logical reason for the whoops- please do get in touch if you know. 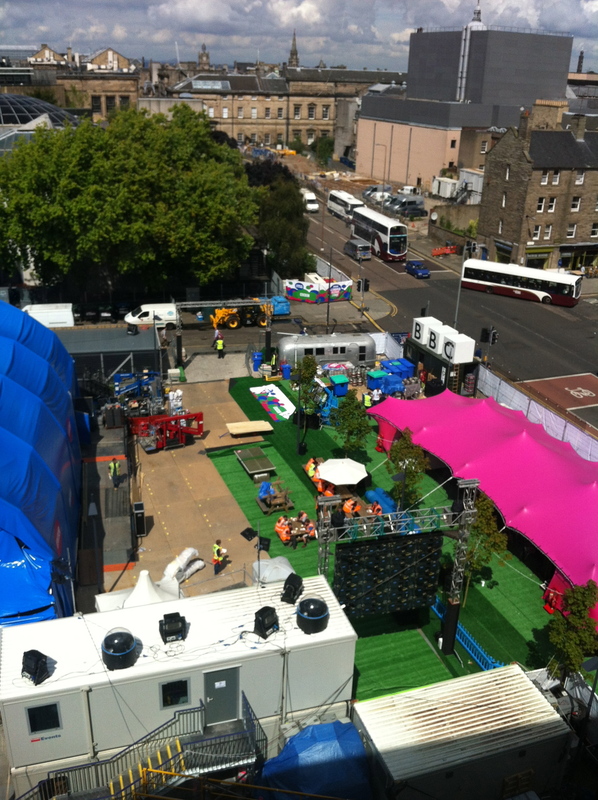 Appleton Labs- the ugly building next to my beautiful Forum – has been transformed into Fringe Central for participants, media and arts industry professionals taking part in the Fringe. This means that visiting the offices over there is much more colourful than usual as actors are starting to drape themselves across sofas in the lobby, complaining loudly about the Dreadful Standards Of Hygiene at the flat they’re sharing with the twelve other members of their company. I experimented with Freedom again. This also involves turning my iPhone off for the two hours, as otherwise i’ll cheat and check emails on that. Which means that the initial part of the two hours was taken up worrying that An Unspecified International Crisis was occurring somewhere and I wasn’t there to solve it (delusions of grandeur creeping in). Yesterday I missed a phone call asking where in Edinburgh one could buy a number of small, circular tables for relatively cheap- not exactly a real crisis (sorry Beckie). Today I missed, well, nothing. Clearly I’m not Batman. Yesterday I typed notes for Ada and GIL, proofed a short piece of life-writing about my grandmother, updated a couple of short stories, and wrote the first half of my mermaid story for ~Flow. Today I focussed on drafting the ~Flow piece. I used the abseiling handymen on top of the Dome as a meditation focus to get myself in the character groove, imagining what it would be like standing where they’re standing, how the wind might catch that high up, the weight of the belts, the pressure of the hardhats on their scalps. How slow and precise their movements must need to be, so their feet don’t slip, so they don’t drop their tools. From there I transitioned into the main character of the ~Flow narrative, an engineer with the working name of Ed. I use a similar technique when writing parts of Ada and GIL, trying to embody how they’d see the world around me, what they’d notice and what significance they’d give it, how they’d bring their own perspective into the space. It’s a fun way of stepping backwards into a pice of writing; have the character do something, refine what they’re doing, then work out why they’re doing it in the first place. Then you can build up the world around them. How lovely that you and Pippa met, Pippa is fabulous! She recommended I apply for a Bright Ideas fellowship at the Genomics Forum, which i did in March and greatly enjoyed!